You might be reading this blog right now because you’re worried over the nightmare that is sewer line damage. If you’ve already heard the horror stories about pipe repair, you’re probably worried that a burst pipe could completely upend your life at home. That’s because traditional sewer repair methods, with their lengthy project times, and deep deep trenches, often cost you a great deal of time, money and comfort. But it doesn’t have to be this way! At Bob Oates Plumbing Sewer and Rooter, we utilize the latest technology to make your sewer repair experience less stressful and less costly. As the foremost provider of sewer pipe relining in Seattle, we’re confident that our sewer relining solutions are just what you’ve been looking for! In order to actually replace damaged pipes, a plumbing company has to dig into your yard or driveway to reach the source of the issue. To dig a big enough trench takes a lot of expensive manpower and equipment Not to mention that once it’s done, you have to worry about paying to get your home or office back to it’s original state. This isn’t the case with the relining process, which uses an epoxy liner to recoat the inside of the failing pipe. 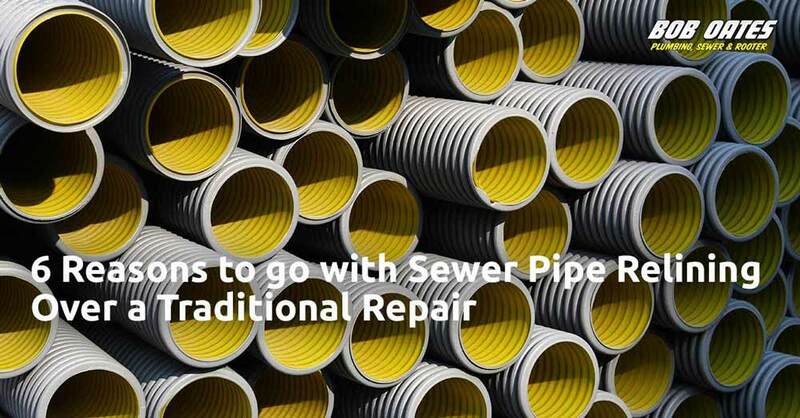 Because of this, the labor and cost involved with sewer pipe relining, or cured in-place pipe restoration, is significantly less than traditional methods. As you can imagine, when someone has to go underground, it requires a good amount of time. In fact, the work is so extensive that it can sometimes take weeks for your sewers to be back in working order. We know that putting your life on hold for that long is unacceptable! But, the technicians at Bob Oates Plumbing Sewer and Rooter are experts in speedy and effective sewer pipe relining in Seattle. We know exactly what to do to get the job done as quickly as possible. In fact, depending on the project, a whole sewer pipe relining could completed in less than a day! As we’ve said, with traditional repair, a backhoe is usually required for digging very long and deep trenches, often times right in your own backyard. Once your pipes are repaired or replaced, the backhoe is used again to re-fill the hole. In some cases, this can go beyond your property line. If it turns out that a plumber has to get into the street in front of your house, you’re looking at a long and irritating process of closing off the area and possibly even re-routing general traffic, in which case you’ll need to get the city involved which is always a pain. When we perform sewer pipe relining in Seattle, we go trenchless, thanks to Nu-Flow’s incredible pipe relining technology. Afterward, it will be like we were never there! Sewer pipe relining is extremely durable. When you opt for pipe relining, the old pipe is not removed but is instead relined with a heavy-duty material. When all’s said and done, you basically have a pipe within a pipe that is double the strength with a negligible loss in pipe diameter. With Bob Oates Plumbing Sewer and Rooter’s pipe relining, you get a longer life out of your sewer system! Your renewed corrosion-resistant pipe can last up to 50 years! Obviously, digging into the ground to get to a damaged pipe is going to disturb the environment in one what or another. But, with traditional methods, the biggest concern is the possibility of contaminants being released into the Earth. Bob Oates’ sewer pipe relining in Seattle can repair your pipe without the use of added chemicals, and the epoxy that the lining is made out of is also friendly to the environment. Plus, since an excavation process is not required, there is much less waste. After the job is completed, there is no need to discard piping, concrete, or other waste into landfills. There is not much to worry about when you go with CIPP lining over trenching and pipe replacement. In addition to keeping your yard and property intact, relining will not affect the performance of your sewer line, and you will not have to be concerned about decreased water pressure. At Bob Oates Plumbing Sewer and Rooter, we’ve adopted a revolutionary process for performing sewer pipe relining in Seattle. We rely on the patented Nu Flow Tech. This is an exceptionally effective, non-invasive approach that works on all sorts of piping including metal, iron, PVC, fiberglass, steel, clay and concrete. The epoxy lining inserted into the old pipe seals cracks and weak points, giving you an essentially “better than new” system. Bob Oates has been serving the Emerald City’s plumbing needs for over 30 years. We are licensed, bonded, and all of our technicians are trained and skilled in using state-of-the-art equipment. Whether you have an emergency or are just looking for someone to maintain the health of your home or office plumbing systems, we are here help. All our parts and work are guaranteed, so you can feel confident that you are receiving best service in the city! Are you in need of sewer pipe relining in Seattle? You can trust in Bob Oates Plumbing Sewer and Rooter to do the job right! Give us a call today!